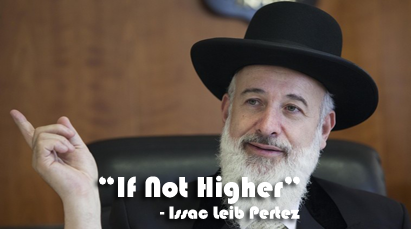 IF NOT HIGHER - Written By: Isaac Leib Pertez. Answer: As the Rabbi of Nemirov would vanish in the previous night of Penitential prayers, people had a strong belief that he ascends to heaven for welfare of the people. But once, a Litvak came there and laughed at them. Pointing out the story from Gemraha, he mocks at them and said that Moses was suspended two and half feet below the heaven. Then, the Litvak decided to test the Rabbi, and secretly entered into the room of Rabbi and hid under the bed. Next morning, the Rabbi woke up realizing the sorrow of people in Israel. He disguised himself as a simple peasant. He took an axe and a bundle of rope and got out of the house, the Litvak followed him. The Rabbi, passed by the village checked every house and headed towards the jungle, cut the firewood, and came back to the village. He stopped in front of an old hut of a lonely old woman. The Rabbi sold the firewood for her but the woman was very weak and unable to put the fire on. So, the Rabbi helped her to burn the fire. When he put the firewood in the oven, he recited the first portion of the penitential prayer. When the fire was in flame, he recited the second portion of the penitential prayers, and recited the third portion of the penitential prayer when he set the fire. After observing all the events, the Litvak knew the reality of heaven and became the disciple of the Rabbi. He said if he could not reach the heaven of higher, he reached it on the earth. Four Levels Of "If Not Higher"
Answer: The story "If Not Higher" written by I.L.Perez gives the message that selfless service is the path that leads someone to heavenly glory. The person who is dedicated to social service achieves heavenly glory on the earth. It also may is trying to tell us something about the true spirit of religion and reality of god or heaven. People generally think that heaven is very high and there dwell the gods and goddess and they become happy only by their prayer and worship. Worship and prayers are necessary a sincerely religious person. Going to the temple or the holy place and reciting the holy books are enough for them. But people do not understand the reality of virtue and try to apply what is mentioned in the prayers and the holy books. The Rabbi of Nemirov knows that there is virtue in the help of the poor and the needy spirits, so he goes to the forest and helps the poor sick woman by bringing fire wood for her. Only then he starts reciting the Penitential Prayers. The more he serves the humanity, the more pleasure he gets. Even heaven is not important for him. It is not necessary for him to go to the Synagogue and to conduct the prayers to reach heaven. To him the house of the sufferer is the holy place, and to help the poor is the real worship of God. Answer: A critical thinker always sees things clearly and objectively to find out the truth. A skeptic habitually doubts the truth of the accepted beliefs. In this connection, we can say that the Litvak is a critical thinker. As all others are thinking doubtfully or just guessing he tries to know where the Rabbi of Nemirov goes at the time of Penitential Prayers. Unlike the ordinary people, he is not satisfied with the accepted belief that the Rabbi goes to heaven at that time. He wants to see skepticism to the end. When he sees the Rabbi recite the Penitential Prayers after helping the sick Jewish woman, he understands the true spirit of religion and becomes his disciple. Then he knows that the pleasure one gets after helping the person in trouble is more delighted than the pleasure one gets in heaven. As a critical thinker, he shows some different behaviour and thought after being the disciple of Rabbi. Always he used to love and have a doubt. At last though he becomes a disciple of Rabbi says that if not higher. This shows that still he does not support solely ( पूर्णरुपमा ) all things as other say. He makes a conditional support. This is the nature of a critical thinker. a. Real meaning of virtue or heaven. b. A Critical Follower of Religion. e. Service help of humanity; true heaven. etc. Answer: " The Heaven In The Earth "
There is an interesting tale about the nose of the leopard. It is famous in Sindhupalchok. The leopard is called there Nepte, or Flat-Nose. Though the leopard seems very active like a cat, in the beginning it was unable to climb trees like the cats. One day he persuaded a cat to show him how to climb. But once the leopard got on the climb of a tall tree, the cat quickly ran away. The cat did not tell the leopard how to get down the trees. The leopard was unable to get down the tree. As he made clumsy efforts to reach the ground, he fell down on his face. He bumped his nose flattening forever. To this day, he is called Flat-Nose. Thereupon, the leopard swore eternal vengeance against the cat. Socrates felt that his friends' genuine expression of grief (sobbing after he drank the poison) would ease his transition from this world to the next. c. There are/is/am not nothing like home. d. She were/was an excellent writer. e. If I were a toad, I'd eat/ate flies. h. This story/stories are/is for the birds. i. These story/stories was/were for the birds. j. Them/These thieves are/is heartless. Bachelor Level Course "If Not Higher"
Question Answers Of "If Not Higher"
Complete Solution Of "If Not Higher"
0 Response to "If Not Higher | Question Answers"